In 2011, Phong Nha - Ke Bang National Park welcomed over 250,000 tourist arrivals, up 5.49%, tourism revenue reached VND 424 billion, up 5.31% over 2010. 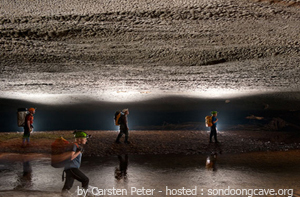 In 2012, caves discovery tourism has been chosen as a main point in tourism development strategy of Quang Binh. The completion of Huu Nghi 3 Bridge connecting Kham Muon province (Laos) and Nakhon Phanom province (Thailand) will open new opportunities for Quang Binh to enhance attracting international tourists by road. A number of tourism cooperation activities in the East- West Corridor will also be promoted and promises to bring economic- tourism benefits for Quang Binh in the near future.